The 1972 Dolphins can pop the champagne, because no undefeated teams remain in the NFL. 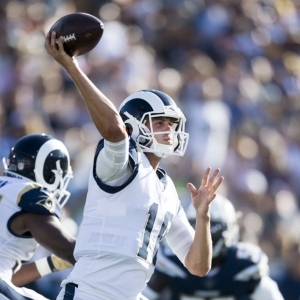 After getting to the halfway point of their schedule at 8-0, the Rams faced a difficult road test at New Orleans in Week 9 and could not get the job done. On the college gridiron, LSU was handed an even tougher task and also failed-miserably, in fact. As for the Major League Soccer playoffs, it was a rough start to conference semifinal action in New York. Los Angeles Rams . It was a roller-coaster ride for the Rams at the Superdome on Sunday. They trailed 35-14 at one point, stormed back to tie things up at 35-35 in the fourth quarter, and then fizzled out down the stretch en route to a 45-35 loss. Los Angeles got torched by Drew Brees for 346 passing yards (211 to Michael Thomas) and four touchdowns. "You find out about yourself when you have a little bit of adversity," head coach Sean McVay explained. "I know that everybody in that locker room is going to respond the right way. Sometimes setbacks can be setups for comebacks and that's the way we look at it." The Rams are still +180 favorites to win the NFC. Nathan Peterman . When are the Buffalo Bills going to realize than Peterman is terrible at playing football? If the definition of insanity is doing the same thing over and over again while expecting different results, the Bills are insane. In fairness, both Josh Allen and Derek Anderson are out…. Still, there are a whole host of free-agent quarterbacks who are exponentially more accomplished-and simply better-than Peterman. But Buffalo decided to send the second-year signal-caller out there against Chicago on Sunday and that led to a 41-9 loss. Peterman threw three more interceptions and is now saddled with a ridiculous 1-to-7 touchdown-to-interception ration this season. He has three TDs and 12 INTs during his brief and infamous career. The Bills are +8 underdogs at the Jets in Week 10. LSU . The Tigers had bounced back from a loss at Florida with consecutive top-25 victories over Georgia and Mississippi State, putting themselves in the initial College Football Playoff and also in contention for the SEC West title. But then Alabama walked through that door. And that door shut on all of LSU's hopes and dreams for this 2018 campaign. The Crimson Tide marched into Death Valley last weekend and manhandled the Tigers 29-0. 'Bama racked up 576 yards of total offense to 196 for LSU-including an anemic 12 rushing yards on 25 carries (worse than a 0.5 average). Thus, the Tide clinched the division title and will face Georgia in next month's SEC Championship. Alabama is a -300 favorite to win the national title. Jimmy Butler . Ten games into the season, Butler is a still a member of the Timberwolves. And he still doesn't want to be; in fact, the four-time all-star has defiantly sat out three contests while citing a need for rest. Minnesota is 1-2 in those games, including a 111-81 loss at Portland on Sunday (its lone win without Butler came when Derrick Rose erupted for 50 points against Utah). The T-Wolves are +5 road underdogs against the Clippers on Monday. Pittsburgh Penguins . The Penguins are still a decent 6-3-3, but they have lost three in a row (0-2-1) after going winless throughout this past week. It started with home-and-home setbacks against the Islanders (6-3 at home on Tuesday and 3-2 in a shootout in New York two days later). Things only got worse thereafter for Pittsburgh, which got blown out by Toronto 5-0 on Saturday. "I think, honestly, when we look back later in the season, this could be a big turning point for us," center Matt Cullen commented. "I hope it is. I think it's a good wake-up for everybody to see. Pucks have been going in and things have been going pretty well, but you can't take that for granted. We have a lot of areas we can still improve on." The Penguins are +1300 to win the Stanley Cup. New York Red Bulls . New York is the Eastern Conference's top seed in the Major League Soccer playoffs, but it has some work to do if it wants to advance through its opening home-and-home series. In leg one of the conference semifinals against Columbus, the Red Bulls suffered a 1-0 road loss on Sunday. After giving up a goal to the Crew's Gyasi Zardes in the 61st minute, the visitors almost got an equalizer from Bradley Wright-Phillips during stoppage time only to see goalie Zack Steffen make an incredible diving save. New York will host the second leg this weekend and must beat the Crew by more than one goal or win 1-0 to force penalty kicks. A one-goal loss by a score of 2-1 or higher would send Columbus through via the away goals tiebreaker. Meanwhile, New York FC lost its conference semifinal opener 1-0 to visiting Atlanta. Atlanta is now a +200 favorite to win the MLS Cup (BetOnline Sportsbook). Roger Federer . By most 37-year-olds' standards (as if most 37-year-olds are still playing professional tennis), Federer's semifinal performance at this past week's tournament in Paris was a productive one. But it came oh so close to being even better. In a thriller against an on-fire Novak Djokovic, Federer threw everything he had at the game's undisputed current best player before eventually falling 7-6(6), 5-7, 7-6(3) in three hours and two minutes. "When you lose a close match like this you always have regrets," Federer assured. "Losing is never fun, so that's why I guess I have this (unhappy) face right now." Djokovic ended up losing to unseeded Karen Khachanov in the final, but the Serb still surpassed Rafael Nadal for the No. 1 world ranking on Monday. Federer is a +400 second choice to win the 2019 Australian Open (Bovada Sportsbook).